Satellite broadcaster Dish Network told top officials at the Federal Communications Commission (FCC) this week to block the proposed $45 billion merger between Comcast and Time Warner Cable because it would create serious anticompetitive pressures in the broadband and video markets, the Los Angeles Times reports. Among Dish's concerns are the leverage a combined Comcast-Time Warner Cable would have in negotiating distribution deals with content suppliers. If approved, Comcast would see its video subscriber base grow from about 22 million to 30 million homes. It would also be the dominant video supplier in several major markets, including New York and Los Angeles. "A combined Comcast-TWC will be able to exercise its enormous size to leverage programming content in anti-competitive ways," Dish said. The result of such leverage would be smaller distributors such as Dish having to pay more for their content. 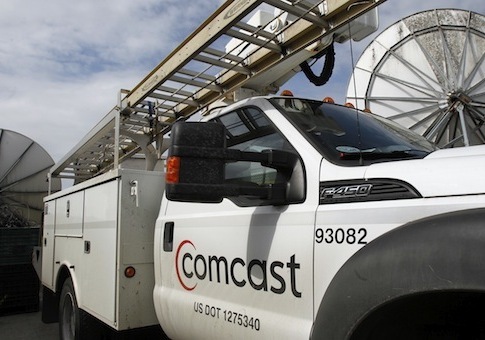 Dish also said acquiring Time Warner Cable would give Comcast too much power over the Internet and the ability to stifle new online video services that might try to compete against it. The FCC and Justice Department and currently reviewing the merger deal. Comcast has extensive ties to the Democratic Party and has donated more than half of its political spending, or about $18 million, to Democrats since 1989.